A huge thank you to everyone who came out and supported LASC’s Fresh Start Gala to benefit the Bankruptcy Pro Bono Program! On February 22nd, more than 120 people filled the beautiful atrium of Porter Wright Morris and Arthur to recognize the hard work of the pro bono attorneys as well as support Legal Aid’s mission. The event raised over $50,000 from sponsorships, ticket sales, individual donations, and silent auction proceeds. Many thanks to our Planning Committee: Brenda Bowers, Jennifer CaJacob, Lisa Eschleman, Stephanie Harris, Mina Khorrami, Melissa Linville, Liz Koehler, Vivian Opelt, Christy Prince, Lauren Prohaska, Myron Terlecky, and Debi Willet. 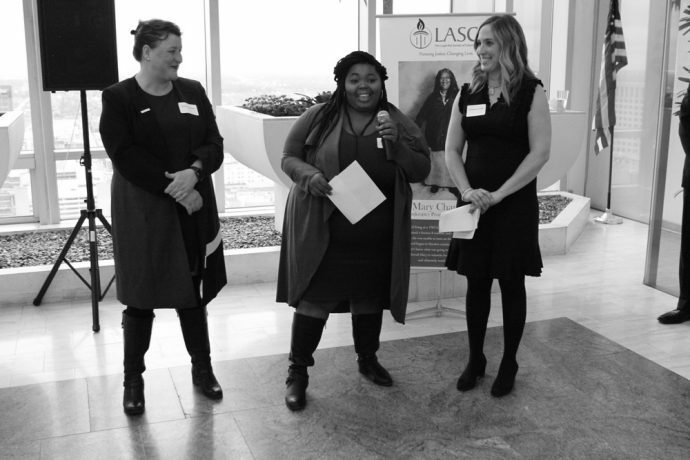 Bankruptcy client Erica Booker, pictured here, spoke about the impact Legal Aid’s programming has had on her life. When her husband lost his job last summer, her family began falling behind on their regular living expenses and after her wages began being garnished, Erica knew she had to do something quickly or they would become homeless. Erica lives in the Near East neighborhood and is an instructional assistant in an elementary school where she works with children with special needs. Erica’s situation is similar to countless others who pick up the phone to call Legal Aid. One event such as a job loss or a medical condition can propel low-income families into crisis mode, and filing a bankruptcy can help bring them back from the edge. Through the Bankruptcy Pro Bono Program, we help people keep their lights and heat on in the winter; we help people reinstate their drivers’ licenses so they can more easily access higher paid job opportunities; and we help stop wage garnishments so clients can better provide for their families. Thank you for helping us provide a Fresh Start for so many! When the Columbus Women’s Commission rolled out a pledge to deal with pay inequity between women and men, about 60 companies signed the document in November. That has swelled to more than 90 companies, with more businesses considering it. The commission, formed a little more than a year ago, has been taking small steps so far in tackling issues affecting women from the workplace to the homeless shelter. It started with the pay-equity pledge, and later this year it is to release recommendations to reduce evictions.